One night many years ago I looked out over a field dancing with fireflies and I had a realization: this is why people believed in fairies. I must have been thinking of Disney's Tinkerbell and her trail of twinkling pixie dust, so much like the swooping, twinkling light of the fireflies. Or J.M. Barrie's description: "when the first baby laughed for the first time, its laugh broke into a thousand pieces, and they all went skipping about, and that was the beginning of fairies." But those dancing lights aren't fairies. They aren't flies, either: they're beetles, actually. In the light of day, they look like nothing special: black beetles, sometimes with a red head. The exact looks of a firefly depends on the species; there are 23 genera and about 200 species of fireflies in North America. The different species also have different flashing patterns at night. (The Museum of Science, Boston, has an animation that shows what to look for to tell the difference.) Some come out at dusk; others wait for more darkness. Some are high in the trees; others are closer to ground level. They also may flash different numbers of times, with different duration, and flying in different patterns while they flash. That way, they only seek mates of their own species. Unless, that is, they've been tricked by an impostor in the genus Photuris, which mimics the flashing patterns of other fireflies to lure them in and eat them. When they're done mating, female fireflies lay their eggs in the ground or in rotting logs. The larva of a firefly looks like a grub, and eats other insects, as well as worms, snails and slugs. The larvae -- and the eggs -- can glow in the dark. 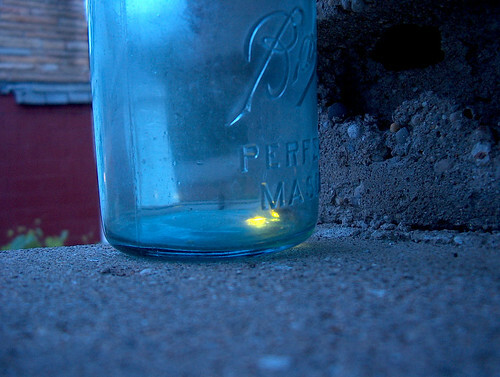 This gives the family of fireflies their name: Lampyridae, from the Latin and Greek words for "glowworm." One theory is that the green glow is a warning sign to predators that these larvae don't taste good. Apparently, the adults don't taste good either. But humans don't care what they taste like. And so we like the dancing green glow: as a sign of summer, as a memory of childhood. Or as a glimmer of hope that fairies really do exist, if we only believe. In the wild: Different species like different habitats, but a good bet is to look at the edge between forest and open field. They also seem to like to be near a source of water. The picnic areas at Rock Creek Park are probably ideal. Habitat. Because they spend a lot of time on the ground during the day, fireflies may be harmed by lawn mowing. In addition, lawn pesticides aimed at grubs may kill firefly larvae, which also live in the soil. This is just one more reason it makes sense to avoid spraying your lawn, and let it grow to at least 3 inches before cutting. Better yet, consider replacing some lawn with plants that do not need to be mowed. Darkness. Some scientists think outdoor lights and streetlights may interfere with fireflies' ability to communicate and find mates. You may have a better show if you leave your outdoor light off. Research. The Museum of Science, Boston asks people to report their observations of fireflies once a week throughout the summer, to learn more about firefly distribution and behavior. Sign up at Firefly Watch. The mulberries are still dropping, but honestly, with all this rain, they're pretty tasteless. The serviceberries are probably also still going. Have you started seeing fireflies yet? Do you have a favorite place to watch them? Leave a comment.